The White-throated Sparrows (Zonotrichia albicollis) are migratory American sparrows that occur naturally in Canada and southern USA. These sparrows follow a well-defined hierarchy, which puts males ahead of females and older sparrows ahead of younger birds. 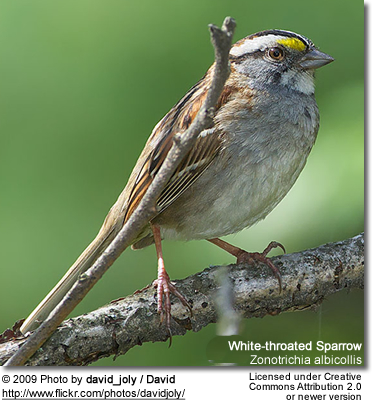 White-throated Sparrows breed in in central Canada and New England; and migrate south to southern United States for the winter. They are rare vagrants to Western Europe. White-throated Sparrows measure 17 cm in length, including its long tail. They are easily identified by their reddish-brown wings and white throats. There are two types – one has white stripes on its crown (the more common form) and the other has tan stripes and a browner head. Those with white stripes tend to be more vocal and aggressive than those with tan stripes. 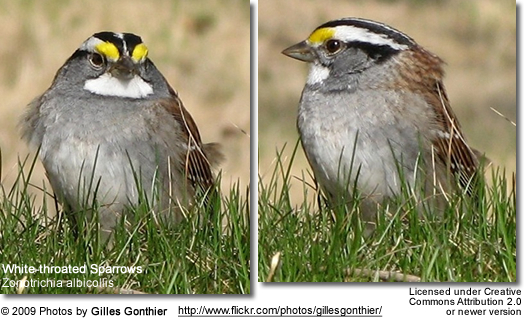 White-throated Sparrows forage on the ground under or near thickets or in low vegetation. They mainly eat seeds, insects and berries. 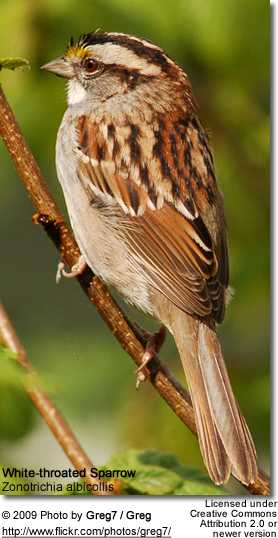 They will also readily visit bird feeders, and are - in fact - the most widespread sparrows at feeders. Their breeding habitats are deciduous or mixed forests. They nest either on the ground under shrubs or low in trees. The average clutch consists of 3 to 5 brown-marked blue or green-white eggs. 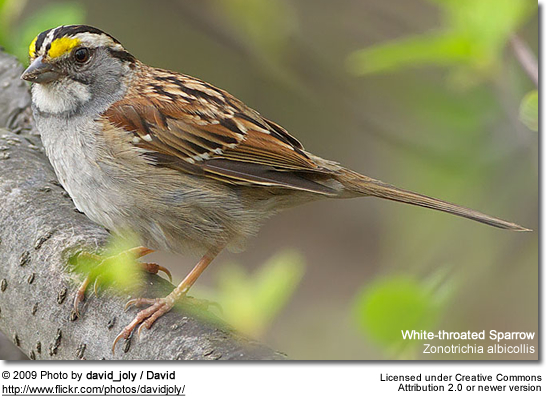 The White-throated Sparrow's song is described as a high monotone whistle with the rhythmic flowof oh sweet Canada, Canada, Canada or a where are you Frederick, Frederick, Frederick. The oldest males are the ones that sing the most.